We can create custom window blinds for your home or business in The Blue Mountains. 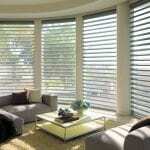 Window blinds can provide you with many benefits in your home or business. Not only do they reduce glare and increase your privacy, but they also make your space feel finished. If you are looking around your home or business in The Blue Mountains, Ontario and wishing for something new, we can help. Or, if you have unusually shaped or oversized windows that you didn’t think you could cover, all you have to do is call us here at Ashtons Blinds to schedule your complimentary custom consultation in your home today. While we have a storefront nearby, we want to bring our samples into your unique space, so we can make sure we find the perfect window blinds for you. Why should you call us at Ashtons Blinds for your new window blinds? Well, where else will you get all this? Excellent, custom-made products: We use top brands that we trust, including Hunter Douglas, Sun Glow Window Fashions, Eclipse vinyl shutters and Graber wood shutters. We bring our samples to you and carefully measure your windows for a perfect fit every time. Competitive pricing: While custom, quality products come at a cost, the expense is well worth it when you factor in how long your window blinds will last and the enjoyment you will get out of them. Expert installation and aftercare: We respect the investment you have made in your window blinds by completing careful, expert installation. If you ever need repairs or have a concern about your blinds, our help is just a phone call away. At Ashtons Blinds, we offer window blinds to residents of Thornbury, Collingwood, Meaford, Owen Sound, Craigleith, and The Blue Mountains, Ontario.